Located in Vancouver, BC, The Beautiful Project was founded in 2007 by designer & illustrator Jeannette Ordas. She happily wears all the hats in this gig and has grown her line of cards into a collection of paper goods that reflects both the clever and the goofy. Sass served up with a wink and a chuckle is our calling card. 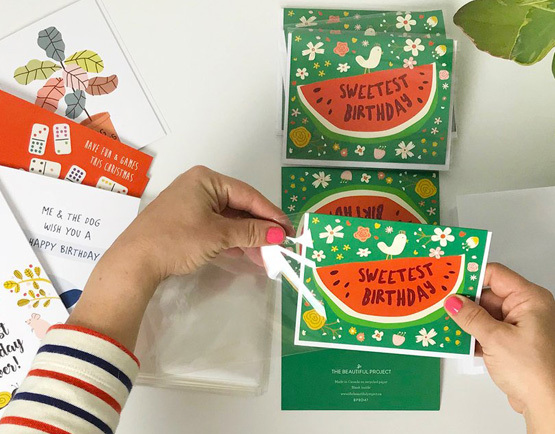 The Beautiful Project is known for its playful & colourful illustrated greeting cards and super rad printed goods, proudly made from recycled card stock. Our original illustrations reflect a love of mid-century design and often feature bright colors, cute animals and an oddball sentiment or two. You can find The Beautiful Project in awesome shops around Canada and the US. Interested in carrying The Beautiful Project’s greeting cards in your smart & savvy retail location? Please fill in our Wholesale Inquiry form and we’ll send you our current catalogue along with our terms & conditions to make ordering a snap. If your shop is in an area served by one of our Sales Reps, we'll send you their information so you can order through them. It's easy!